Flower size: 15mm (approx. 9/16"). Earrings length: 1 1/4". Weight: approx. 3.8 grams. Stamp: 925. Hoop size: 28mm (approx. 1 1/8") wide and 1 3/16" long. Width: 5.7mm (approx. 1/4"). Design: yellow gold plated Plumeria scrolling. Weight: approx. 8.4 grams. 925 stamped for authenticity. Hoop size: 27mm (approx. 1 1/16") wide and 1 5/16" long. Width: 5.9mm (approx. 1/4"). Design: Plumeria scrolling. Weight: approx. 10 grams. 925 stamped for authenticity. Hoop size: 27mm (approx. 1 1/16") wide and 1 5/16" long. Width: 5.9mm (approx. 1/4"). Design: yellow gold plated Plumeria scrolling. Weight: approx. 10 grams. 925 stamped for authenticity. Hoop size: 28mm (approx. 1 1/8") wide and 1 3/16" long. Width: 5.7mm (approx. 1/4"). Weight: approx. 8.4 grams. 925 stamped for authenticity. Flower size: 6.75mm (approx. 1/4") in diameter. Weight: approx. 0.5 gram. Stamp: 14k. rand new solid sterling silver (not plated, not bonded) Hawaiian Plumeria flower leverbacks dangling earrings with white CZ. Each flower has a diameter of 24mm (approx. 1"). Each pair of earrings weigh approx. 6.5 grams. Each petal of the flower has brush finish with smooth polish edge. Brand new solid sterling silver (not plated, not bonded) 2 tone Hawaiian Plumeria flower dangling on leverback earrings with white/clear CZ. Each flower has a diameter of 24mm (approx. 1"). Each pair of earrings weigh approx. 6.5 grams. 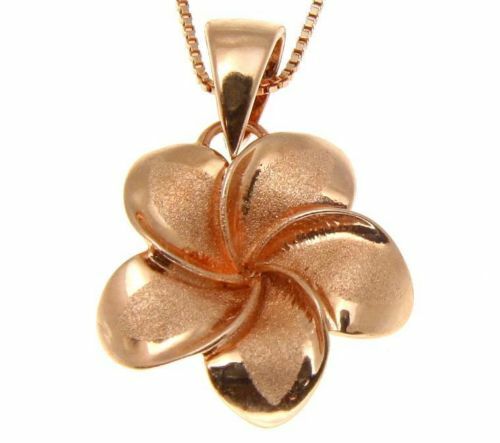 Each petal of the flower has brush finish with gold plated edge. Flower size: 15mm (approx. 9/16"). Earrings length: 1 3/16". Weight: approx. 4.2 grams. Stamp: 925. Flower size: 24mm (approx. 15/16") in diameter. Petal design: yellow gold plated edge around brush finish. Weight: approx. 7.8 grams. Stone: Cubic Zirconia (CZ). Stamp: 925. Rhodium finish: white gold with yellow gold look. Flower size: 24mm (approx. 15/16") in diameter. Petal design: pink/rose edge around brush finish. Weight: approx. 7.8 grams. Stone: Cubic Zirconia (CZ). Stamp: 925. Rhodium finish: white gold with rose gold look. Flower size: 24mm (approx. 15/16") in diameter. Petal design: polish edge around brush finish. Weight: approx. 7.8 grams. Stone: Cubic Zirconia (CZ). Stamp: 925. Rhodium finish: white gold look. Brand new 14k solid yellow gold (not bonded, not filled) small Hawaiian Plumeria flower post earrings. Each Plumeria measures 7mm (little bigger than 1/4 inch). Each pair of earrings weigh approx. 0.9 gram. Each flower has brush finish with diamond cut on the edge of each petal. Stamp: 14k. Flower size: 7mm (approx. 1/4"). Petal: brush finish with diamond cut edge. Weight: approx. 0.9 gram. Stamp: 14k. Brand new 14K solid white gold (not bonded, not filled) Hawaiian Plumeria flower post earrings. Each Plumeria measures 7mm (little bigger than 1/4 inch). Each pair of earrings weigh approx. 0.9 gram. Each flower has a brush finished and diamond cut on the edge of each petal.